Its not just the UK. Here in the US the economy just got a massive kick in the balls last month. I own a small logistics company and Trumps trade war has been catastrophic. Certain kinds of freight have dropped more than 60% since this time last year. That is from DAT, the firm that tracks all freight prices. Not just that, but Farmers are suffering far higher bankruptcy rates than the 2008 recession. 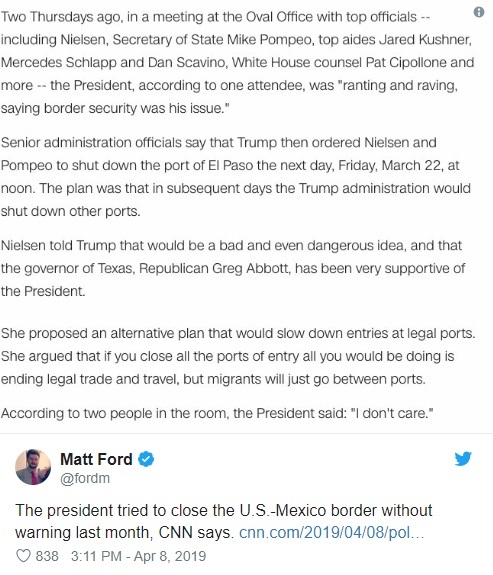 and to make it worse, the government wont insure the ruined crops that were just flooded because they were still in storage and had not been shipped because of the trade war. Not just that, but we only made 20,000 jobs last month, which is a tenth of the 199,000 that Obama averaged. The only reason this didnt happen earlier is because Trump dumped a trillion dollars in the economy, which produced less than a million jobs. A trillion is a million millions. He spent a million dollars per job. More than most of them will make in 20 years. These right wing xenophobic dotards in both the US and UK are destroying our countries. Its not foreigners ruining our countries, its the very people blaming them. Meanwhile, China's stock market recovered all their 2018 losses and their manufacturing is booming. Likewise, all those ecstatic reports from neoliberal news sites about how China is getting crushed by the trade war have mysteriously disappeared and even a literal minor 300 point rise in the Dow Jones is being celebrated as if Trump just fathered the messiah. It's almost as if China spent 2018 pricing in the trade war and cracking down on inefficiencies in their economy and we assumed we won because corporations used that free trillion dollars to buy back their own stocks, creating a massive bubble that is starting to burst. Gasp. Britain's most senior civil servant has privately warned cabinet ministers of the dire consequences of a no-deal Brexit. Sir Mark Sedwill, the cabinet secretary, told ministers that leaving the EU without an agreement will result in food prices rising by ten per cent, the police being unable to protect people and the economy suffering the worst recession in a decade. Direct rule would have to be restored in Northern Ireland for the first time since 2007 and the government would come under pressure to bail out companies that had gone bust, he warned. In an explosive 14-page briefing sent to every cabinet minister and obtained by the Daily Mail, Sir Mark said leaving without an agreement would make Britain "less safe" and see pressure on law enforcement authorities "enormously increase". The German manufacturing sector "is clearly in deep recession" and is laying off workers, analysts said in notes today on data from the IHS Markit purchasing managers index, a measure of sentiment among factory executives. Today's data shows that manufacturing is falling even faster than feared from estimates published a week or so ago. Meanwhile, unemployment in Italy has started to rise, up 0.6 percentage points since late last year to 10.7%, after years of decline. The collapse of German manufacturing is being mirrored across the continent. The average for the entire eurozone — the 19 countries that use the euro as a currency — is now in negative territory. Of the four largest economies, only Spain is in positive territory. The Pantheon Macroeconomics analyst Claus Vistesen called the numbers "horrific" and "horrible" in a note he sent to clients on Monday. 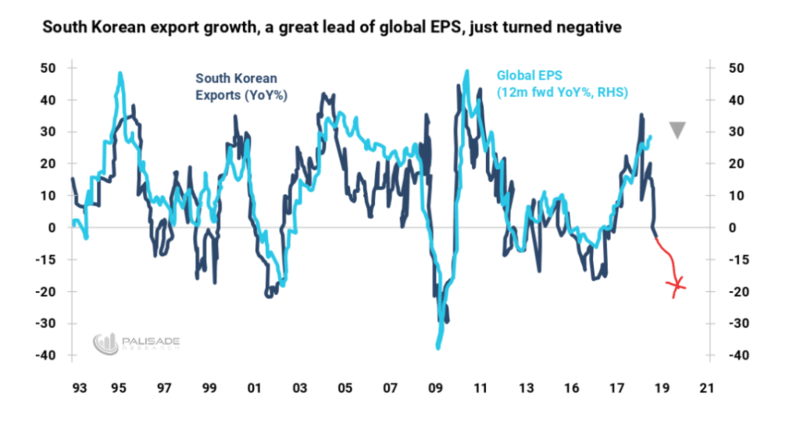 I first formed my “there will be a global earnings recession in late 2019” hypothesis when I saw the South Korean Export Growth indicator (aka SKEG) plunge in May 2018. And ever since then – I’ve continually added new evidence and information – re-calculating the value of my hypothesis. By October – I firmly believed there was an 85% chance there would be a global earnings recession over the next six-through-twelve months. And by December – this number was at 90% (giving me a 10% margin for error). So – what’s the value now? It’s at 95%. . .
Now – I don’t usually put a hypothesis value so high (I prefer to have a thick margin for error).But all the information and evidence is hard to ignore. For instance – the recently updated SKEG chart (which I wrote about two weeks ago) shows that South Korean export growth has collapsed much more since May 2018’s sharp plunge. (note the red-line highlighting current South Korean Exports Growth year-over-year). Germany factory orders just fell off a cliff. Debt based economies are honestly moronic. If we lived within our means and only budgeted for excess and stored value during boom times we could actually maintain quality of life during bust times. I'm not going to claim that a market socialist economy wouldn't have recessions. Just that they would be less volitile and the vast majority of people wouldn't experience any loss. Imagine if the profit and public funds that go into executive pockets instead were split between the workers and a public safety net. During recession coops could lower production and subsist off of their excess income from years prior while the government directly stimulates the economy with stored wealth. Recessions would also be much less volitile if we didn't overproduce as much and focused on needs that have measurable demand. I'm not saying we could guess exactly or that we should try to plan the economy. I am saying that it makes zero sense to be producing millions of excess Funko Pop figures no one buys when people need food. I'm not saying we shouldn't produce luxuries either. But when the funko pops stop selling stop bloody producing them. The capitalist apologists here are probably thinking, "what the hell is he on about? Companies already do that no?" No they actually don't. I don't even need to give you a detailed explanation, go outside and observe it yourself. During every holiday season capitalist inefficiency is very visible. Go to the store and look at all the useless holiday themed junk that never sells. Now apply that same observation to the rest of the economy and you'll notice the problem. Inefficiency is more visible during the holidays but it is always happening. So if aiming one revolver at our head and pulling the trigger wasn't fun enough, now we're gonna empty two revolvers into our skulls AT THE SAME TIME!